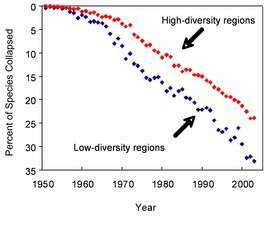 Loss of seafood species is faster in low-diversity regions, as compared with high-diversity regions. In a study published in the November 3 issue of the journal, Science, an international group of ecologists and economists show that the loss of biodiversity is profoundly reducing the ocean’s ability to produce seafood, resist diseases, filter pollutants, and rebound from stresses such as over fishing and climate change. The study reveals that every species lost causes a faster unraveling of the overall ecosystem. Conversely every species recovered adds significantly to overall productivity and stability of the ecosystem and its ability to withstand stresses. The good news is that the data show that ocean ecosystems still hold great ability to rebound. 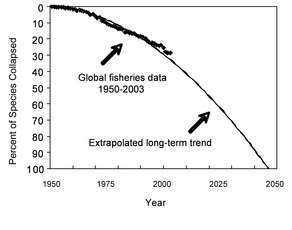 However, the current global trend is a serious concern: it projects the collapse of all species of wild seafood that are currently fished by the year 2050 (collapse is defined as 90% depletion). Collapses are also hastened by the decline in overall health of the ecosystem – fish rely on the clean water, prey populations and diverse habitats that are linked to higher diversity systems. This points to the need for managers to consider all species together rather than continuing with single species management. “Unless we fundamentally change the way we manage all the oceans species together, as working ecosystems, then this century is the last century of wild seafood,” says co-author Steve Palumbi of Stanford University. Many of the economic activities along our coasts rely on diverse systems and the healthy waters they supply. “The ocean is a great recycler,” explains Palumbi, “It takes sewage and recycles it into nutrients, it scrubs toxins out of the water, and it produces food and turns carbon dioxide into food and oxygen.” But in order to provide these services, the ocean needs all its working parts, the millions of plant and animal species that inhabit the sea. The strength of the study is the consistent agreement of theory, experiments and observations across widely different scales and ecosystems. The study analyzed 32 controlled experiments, observational studies from 48 marine protected areas, and global catch data from the UN’s Food and Agriculture Organization’s (FAO) database of all fish and invertebrates worldwide from 1950 to 2003. The scientists also looked at a 1000-year time series for 12 coastal regions, drawing on data from archives, fishery records, sediment cores and archeological data. “We see an accelerating decline in coastal species over the last 1000 years, resulting in the loss of biological filter capacity, nursery habitats, and healthy fisheries,” says co-author Heike Lotze of Dalhousie University who led the historical analysis of Chesapeake Bay, San Francisco Bay, the Bay of Fundy, and the North Sea, among others. The scientists note that a pressing question for management is whether losses can be reversed. If species have not been pushed too far down, recovery can be fast — but there is also a point of no return as seen with species like northern Atlantic cod. The buffering impact of species diversity also generates long term insurance values that must be incorporated into future economic valuation and management decisions. “Although there are short-term economic costs associated with preservation of marine biodiversity, over the long term biodiversity conservation and economic development are complementary goals,” says coauthor Ed Barbier, an economist from the University of Wyoming.